Social networking has spread around the world with remarkable speed. In countries such as Britain, the United States, Russia, the Czech Republic and Spain, about half of all adults now use Facebook and similar websites. These sites are also popular in many lower-income nations, where, once people have access to the internet, they tend to use it for social networking. Lots to chew on here, but can’t help but immediately notice the prevalence of political usage of social media in the Middle East and North Africa. 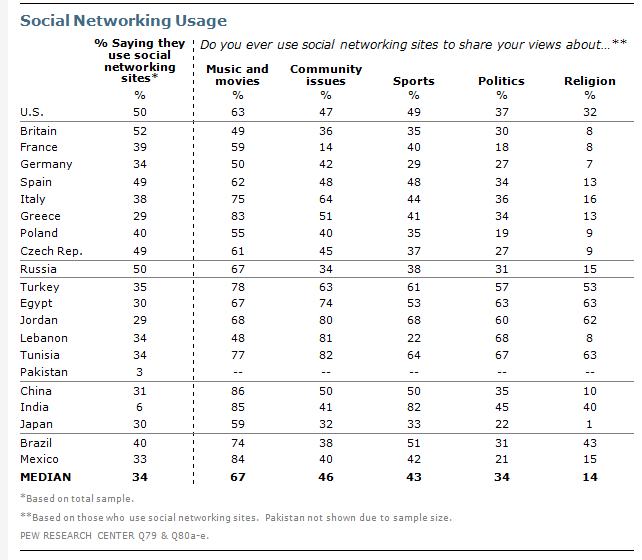 Not only are the proportions of users of social media discussing politics higher in these countries than anywhere else, but Egypt, Lebanon, and Tunisia appear to be the only countries in the study where social media is used more often to discuss politics than sports.